Below is a list of links to and brief descriptions of common software components. It's useful to keep these in mind and reference them during software design as a shorthand for code that will be written to implement the design. Implementing a component could involve just a few or many lines of code. Describe in words the problem to be solved. This might include references to software components listed below. You might also include solution acceptance criteria, possibly in the form of formal acceptance tests. Draw a block diagram of the main problem solution pieces. For more complex problems, other types of diagrams can be used. Annotate the block diagram with references to components such as those below. Code the solution in your chosen programming language. There are many elements that can be included in an Android app. It's helpful to see how these are clustered and interact, as shown in the chart below. Only major elements are shown. The Android Developers Website provides details on the full set of app elements. The minimum required elements are shown with a red dot. An app with just these elements wouldn't be very useful, but you can see that there are many optional elements that can be added for a variety of functions. Intents are used to request an action from an app component. Intents are detected and acted upon by Broadcast Receivers. Activities manage the Displays that app users see. Fragments are modular sections of an Activity that, among other uses, facilitate app adaptation to various screen sizes and dimensions. The User Interface includes a variety of pre-built elements that facilitate constructing screen displays, including: View, Control, Dialog, Notification, Setting, Action Bar, Menu and Toast. Services perform long-running operations in the background and do not provide a User Interface. These elements facilitate asynchronous operations that protect the UI thread from undesirable delays. Loaders make it easy to asynchronously load data in an Activity or Fragment. AsyncTask allows performing background operations and publishing results on the UI thread without having to manipulate threads and/or handlers. These elements facilitate the access to Data, Devices and Sensors. Connectivity provides access to devices and the Internet. Content Providers can optionally be used to access databases and internal/external files. Sensors include: GPS, network location, accelerometer, gyroscope and more. These elements are essential for app operation. Libraries provide access to compiled code from Google and other sources. Access to the user Display is built into the operating system. The Manifest include essential information about the app and its elements. Resources include: Layouts, Values and Drawables. Shared Preferences are use to store key-value pairs that act as global variables for the app. There are a number of key methods for accessing data via an Android Content Provider or directly on the underlying SQLite database. The table below summarizes the method parameters and return values. The graphic is from the video training course Learning Android App Programming. 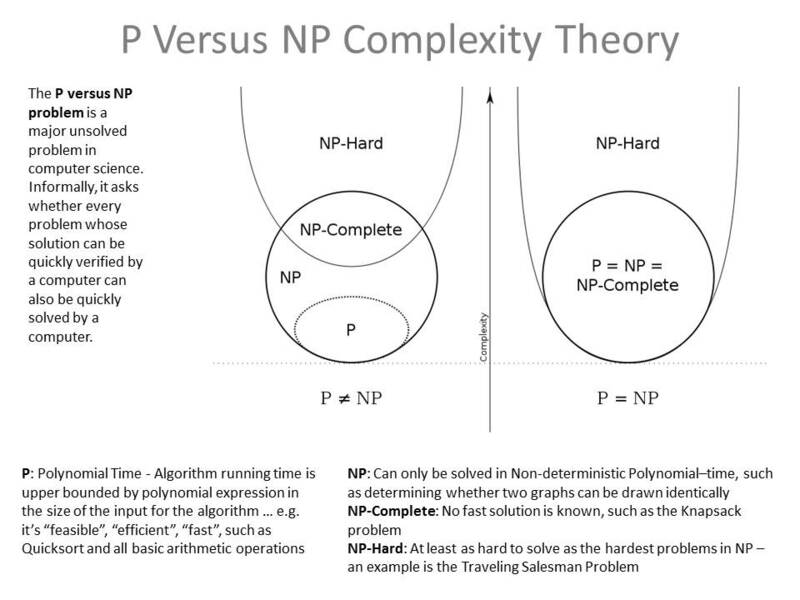 The P Versus NP issue deals with whether every problem whose solution can be quickly verified by a computer can also be quickly solved by a computer. This is a major unsolved problem in computer science. In common, practical terms, it deals with how to identify problems that are either extremely difficult or impossible to solve. In order of difficulty from easy to hard, problems are classified as P, NP, NP-Complete and NP-Hard. So why do we care? When approaching complex problems, it's useful to have at least some idea of whether the problem is precisely solvable, or if an approximation is the best that can be accomplished. You can also use the Java Comparator class methods to implement your own list item comparison functions for specialized sorting order needs. The Java Collections class (plural) is different than the Collection class (singular). Which sorting algorithm (see below) is used in the Collections.sort() implementation depends on the implementation approach chosen by the Java language developers. You can find implementation notes for Java Collections.sort() here. It currently uses a modified merge sort that performs in the range of Big O O(n log(n)). Speed of the algorithm for the best, average and worst sort times. Most algorithms have sort times characterized by Big O functions of O(n), O(n log(n)) or O(n^2). The relative importance of the best, average and worst sort times for the sort application. Memory required to perform the sort. Type of data to be sorted (e.g., numbers, strings, documents). The size of the data set to be sorted. The need for sort stability (preserving the original order of duplicate items). Distribution and uniformity of values to be sorted. Complexity of the sort algorithm. For a comparison of sorting algorithms based on these and other values see: https://en.wikipedia.org/wiki/Sorting_algorithm#Comparison_of_algorithms. Bubble sort: for each pair of indices, swap the items if out of order, loop for items and list. Cocktail sort: variation of bubble sort, passes alternately from top to bottom and bottom to top. Timsort: adaptative algorithm derived from merge sort and insertion sort. Patience sorting: based on the solitaire card game, uses piles of "cards"
Below is a summary of Android releases and device support. It shows that by using the Android Support Libraries you can code your apps to run on a large percentage of Android devices. A battle is raging over whether native mobile code apps, such as those for Android and iOS, are a better approach than using HTML5. Each has its advantages. There is, though, a way to blend the two in order to take advantages of the benefits each has to offer. The graphic below shows the anatomy of an app that displays an HTML5 Canvas on an Android screen display. This app is from the Learning Android App Programming video training course. The HTML5 Canvas animation displayed is from HTML5 Canvas for Dummies. Android Service components can be implemented using a number of mechanisms. If you want your Service to be able to communicate with other applications running in separate processes, using Inter Process Communications (IPC) is one approach. The diagram below shows the major classes and methods needed in the binding activity and bound service. The details of this implementation can be found on the Android Developers Web site here on the Bound Services page. Service - Application component for longer-running operations that do not interface directly with the user. ServiceConnection - Interface for monitoring a service. Messenger - Creates a Messenger pointing to a Handler in one process, and handing that Messenger to another process. Message - Description and arbitrary data object that can be sent to a Handler. IBinder - Interface for a remotable object. Handler - allows you to send and process Message and Runnable objects associated with a thread's MessageQueue. Broadcast Receivers are one of the four basic Android components, along with Activities, Services and Content Providers. Broadcast Receivers respond to Intents issued by the Android system or Android apps. It's one way to respond to "things happening" on the user device. 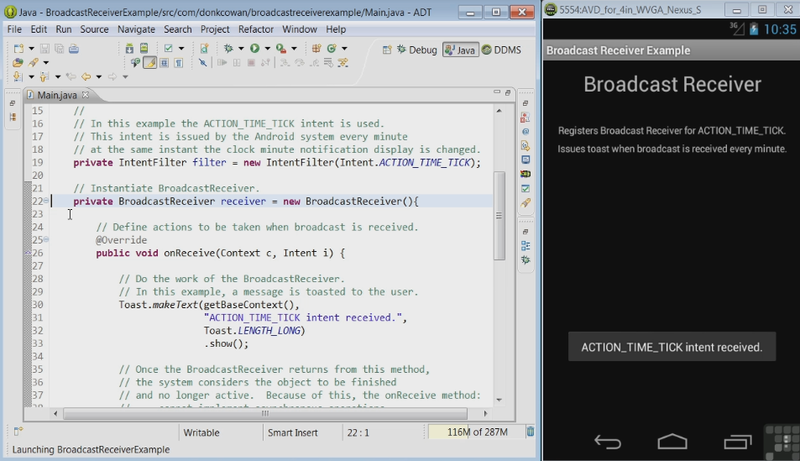 The video below from the training course Learning Android App Programming explains the basics of Broadcast Receivers. It can be challenging to remember the details of all the SQL Join operations. A convenient way to do this is to use Venn diagrams shown below. 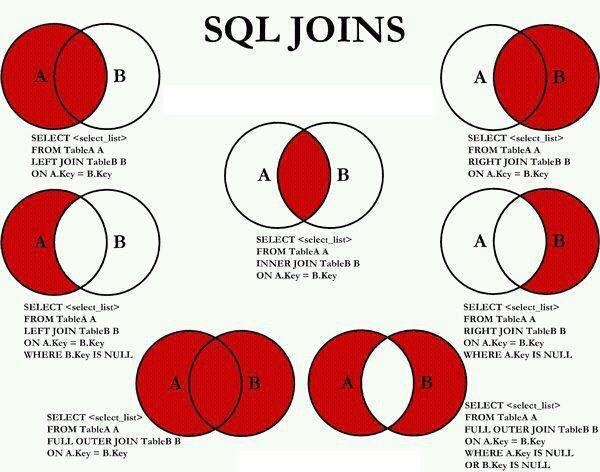 For examples of SQL Joins, go here. inner join: requires each record in the two joined tables to have matching records. outer join: does not require each record in the two joined tables to have a matching record. Android listeners are the mechanism used to respond to user interaction with a display screen. Setting up a listener is a very common Android coding task. Although it can be done with just a few lines of code, it involves a number of elements that must be configured to interact correctly. The diagram below from the video training course Learning Android App Programming dissects the code to establish a listener for a screen button.